Two weeks ago The Copperfield signed Trampoline as their agency of record, two weeks from today their new restaurant will present its first dinner. 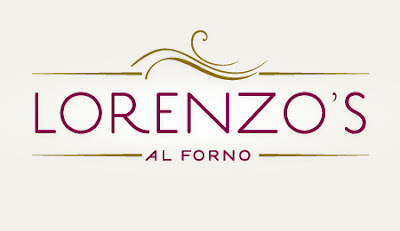 Lorenzo's al forno has been a labor of love, with center stage occupied by a custom wood-fired oven, which will be used for items on the menu created by Chef Stephen Topper. The atmosphere is relaxed, the setting is beautiful and the menu is influenced by Northern Italy and designed to evoke a sense of celebration. 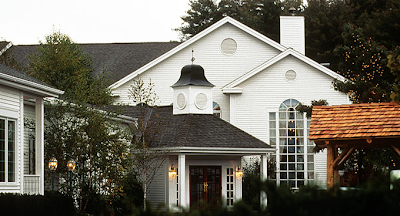 Chef Topper and his team will devote the first two evenings of service to a hand-picked group of individuals. 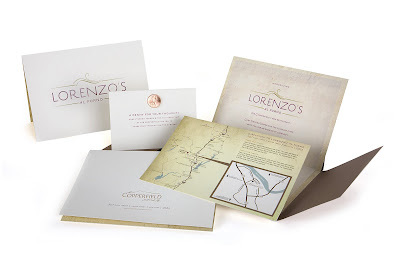 After receiving a penny for your thoughts invitations, these guests will reflect on their experience and help to inform the service of the official Lorenzo's launch on Friday, July 10th. Do you take this mark? To new beginnings and happily ever afters. The Copperfield's new mark and their first dance in WellWed. This idea was sparked at Rotary as, in my role as GIT (greeter in training) I got the whispered aside: When they begin the pledge of allegiance you can stop, otherwise you'll be here forever. And honestly, I would have. We thought, in the interest of practicing what we preach, we'd offer up the odd post (they're all a bit odd aren't they?) that gives a tip. So special thanks to Susan for today's tip, and now for a couple for you. When "tweeting" — publishing 140 character or less posts on your Twitter account, put the @ symbol before a person's account name to alert them that you are referring to or directly addressing them. People can then click a pre-set search from the right hand side of their Twitter homepage to call up all Tweets with @myname in them. This way people can search on http://hashtags.org to see all tweets about the particular term or can also search in the Twitter search, again on the right hand side of their Twitter homepage. Tips are free. Twitter is free. And now you are free to dip your toe in the twater. There might be an awkward pause, either from a competitive spirit or a don't-want-to-jinx-it superstition, or maybe even just because small talk is awkward. Our answer tends to be a light-hearted, knock-on-wood, "Pretty good." And it is, but in all honesty it's taken a few months to say it with feeling. We've kept our heads down and our energy up as we have managed relationships, worked through budgets and made a case—for advertising and for ourselves. We have one client debuting next week to a receptive and excited audience. We had another client travel to London and sign Oxford. 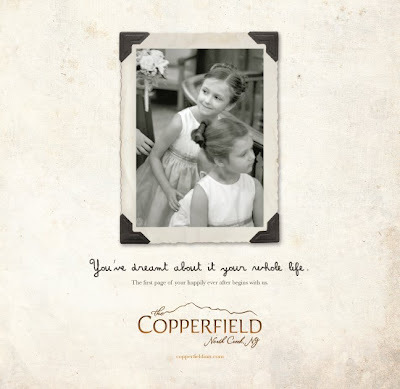 We received word on Thursday that The Copperfield Inn Resort has named Trampoline Design as their agency of record. The next day their website, elegantly designed by the team at Mannix Marketing, went live. Today we hosted a strategy session at our office regarding the opening of Lorenzo's, a new Italian restaurant helmed by Chef Stephen Topper. 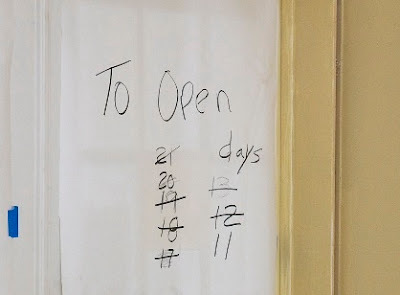 The entire staff of The Copperfield Inn Resort is watching the countdown and looking forward to opening Lorenzo's doors. 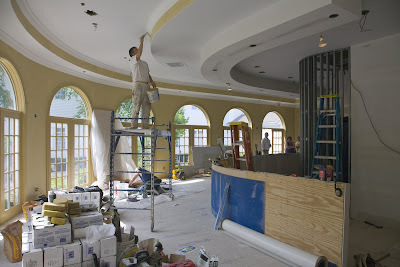 Located in the heart of the resort, Lorenzo's will feature flair in the culinary prowess of Chef Topper and his team, while literal flare will be on display via a sort of cooking-in-the-round approach with a wood fire oven. Next week we'll take the entire staff for a Copperfield Inn Resort experience and look toward a summer of doing what we love for a place that, quite frankly, is easy to love. 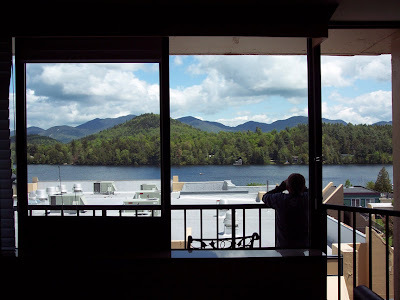 To the Adirondacks, The Copperfield Inn Resort and to being able to say with conviction, "Things are great." On the heels of our Nori celebration, we find ourselves pondering awards. Future contests to enter, sure, but even more intriguing, awards to hand out. Best dilution of a message. Best vanillazation of a concept. And for the Best in Show equivalent, the award for most consistently undervaluing the creative process and diminishing the worth of your own campaign by assuming you can do it better. Nah, only when we know how badly a worthwhile organization has shot itself in the foot. Tramps, it's what we call ourselves. Beat 'em to the punch, right? It's not that we're loose or easy, just addicted to the process and willing to do it just about anytime and anywhere. As is the way of tramps, we've seen inevitable change in the last year with people coming and going. An elegant designer and type-purist in Amy. A swift (of wit and wheel) and brilliant photographer/designer in Mike. Funky, addicted-to-cool and perennial client favorite, designing principal Derek. Unadulterated brilliance, savvy and irreverence in caffeinated codeinatrix Leslie. Ideas, wordsmithing and comedic nerves shared in Tweets in new business development gal Amanda. Enthusiasm, sarcasm and typographical one-of-a-kindness in the endlessly connected Erin. Persistence, persuasiveness, and optimism in our flame-tressed production coordinator Trina. A by-the-books office manager with decades of medical industry experience in Paula the whip-cracker. Strategy, precision and a tireless pursuit of collective satisfaction in resident concept and song and dance guy Sean. Time to add a code tramp to the mix. That all sounds so official. Yes and no. Becoming a Tramp is easy, staying a Tramp is the best kind of hard— equal parts gratifying, challenging and exciting. PS Any good Tramp should be able to Flash. It's not love (though we each have that) it's triumph. It's the Mile High Club, ok, not really, but c'mon, how often do you get to write that? None of the Above <--- Multiple Choice, pick D.
There were seven of us from Trampoline attending the ceremony, one for each award. Despite a few awkward moments (feel free to stop by the office, we prefer dishing in person), we had a great time, but all things being equal, our most enduring high is from a happy client and an engaged audience. Those two things add up to something that carries more weight, and needs no dusting. Here's to winning, no matter what the arena. *With special thanks to Cole Porter in honor of tonight's Tony Awards. Ideate is an innovative software framework for research organizations to manage and optimize their operations. The work done to create an identity and launch the brand was intense; with the audience being a very specific segment of the academic world and the company presenting such an unprecedented research management tool. 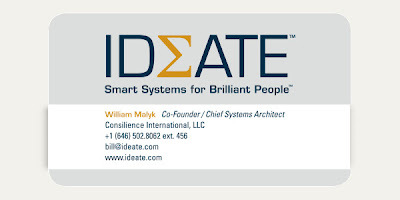 After researching the industry and painstakingly distilling the message to create a brand identity that would convey progressive, reliable and human, the Ideate brand, complete with website, business cards and quirky illustrations, was born. Congratulation on the brand graduation! Sometimes you just have to give credit where credit is due. 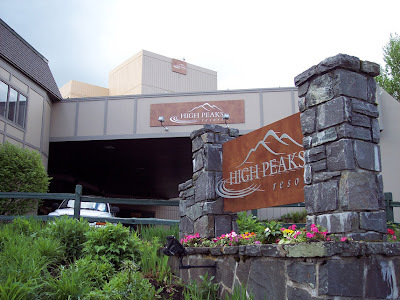 Bill Gathen at High Peaks Resort has done an impressive job drumming up interest, business and a vibrant stream of Tweets thanks to his "Elevate Your Rate" promotion on Twitter. The hook: Bill sends out a Tweet at some point between 8am and 8pm with an Adirondack High Peak and its elevation. The elevation is the rate that High Peaks Resort will be offering for reservations made in the following 46 minutes, a Tweet with Whiteface Mountain's elevation of 4867 would translate to a rate of $48.67. The promotion caught our eye (and our fancy). We've since taken advantage of the rate in order to have a little downtime in the High Peaks. The promotion really works, with the people in front of us and behind us as we prepared to check in, were all there taking advantage of the Elevate Your Rate deal. A quick tour of Twitter shows lively conversations between about-to-go Twitterers and can't-wait-to-get-up-there Twitterers. Bill has also wrapped in an entertaining Adirondack haiku series and great links to things to do in the Adirondacks via his Twitter account. Ultimately what he has done, and done well, is engaged an audience making use of tools available to him. Time will tell if the promotion translates to second stays, but right now it's pretty clear people are talking about High Peaks Resort and Placid is getting traffic from the efforts of a savvy guy in a great hat. Hats off to you, Bill. See you again soon. Passing Fancy or Must-Have Tool? "Internet? Bah, CB of the '90s." I'm not sure I'd go so far as to call social media and all the tools that go with it "the CB of the new millenium," but I would say their power rests in the hands of the user. This tool that is being bandied about by everyone from newspapers and corporations to celebrities and political figures, is another layer in the greater conversation. Because for all the talk about strategies and campaigns, social media comes down to people. If the people managing your social media are not invested, enjoying themselves or incentivized in some way, it will fail. This new avenue for communicating is not a place for static messaging, it is an exchange*. Social media is listening and responding, engaging and affecting. Whether you want to counter a public perception of something or you want to gather information that enhances your ability to perform your job, social media can reveal new data, but you have to be social. Social media has the potential to be an incredible tool. If it isn't a passing fancy. If it's more iPhone than CB. How costly will catching up be? *There's always some sort of disclaimer or fine print, right? Well, as much as we'd like to be the exception to the rule, we have to say this: Social media is social, unless you don't want it to be. You are in control, which means that if what you desire is simply to observe and gather information, you can arrange your tools in such a way that you are able to hear the conversations and people that interest you, or benefit you.